Cobb, Sour Dough or any Round crusty loaves make great serving dishes and they are edible. They can be used to serve thick soups, stews, chowders, dips, and spreads. Note: Small crusty rolls can also be used in this recipe. Using a serrated knife, slice off the top of the Cobb loaf. Pull out the soft centre leaving about a 1-inch thickness of soft bread dough around the inside of the crust. Melt 1/4 cup butter or olive oil with 1 clove of minced garlic and fresh parsley. Brush inside of bread bowl and dough side of lid with butter mixture. Bake at 200 degrees for 5 to 10 minutes until golden. * The top may be used as a lid or cut into dippers. * Save the inside bread dough for croutons or bread crumbs. * You may omit the butter, oil, and garlic, if you wish. 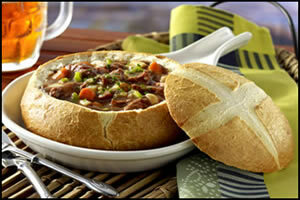 * Use bread bowls to serve soups, stews, chowders, dips and spreads. * Encourage eating of the bowl.